The Yale Peabody Museum of Natural History will participate in a venture to essentially create a digital encyclopedia providing free virtual access to detailed anatomical scans of vertebrate specimens from 16 U.S. museums and institutions, as well as the extensive data accompanying them. 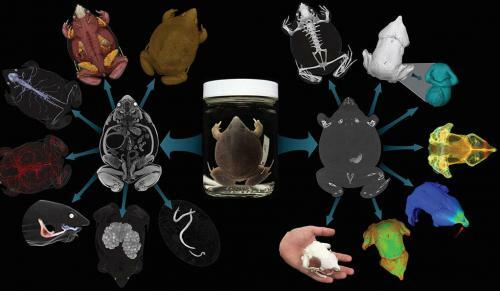 Called oVert, short for “Open Exploration of Vertebrate Diversity in 3D,” the project will use non-invasive x-ray computed tomography (CT) scanning on over 20,000 vertebrate specimens to generate high-resolution digital anatomical data. The project is supported by a $2.5 million grant from the National Science Foundation.Gregory Watkins-Colwell, collections manager for herpetology and ichthyology in Peabody’s Department of Vertebrate Zoology, is the lead principal investigator (PI) for the Peabody portion of the grant. Working with Yale students, he will select and prepare representative specimens — ones with innards intact. That means soaking them in an iodine dye to enhance contrast in soft tissues.